It’s easy to get lost in all the information about retirement plan options allowed by the law. The Employee Plans (EP) Office of the Internal Revenue Service [IRS] created and launched an online tool called “IRS Retirement Plans Navigator”, a web site to help small employers find the retirement plan information that’s right for their business. I immediately try the “Retirement Plans Navigator”. Here I share my experience here. Enjoy! Plan options if employers are a public school, college or university, tax-exempt organization, or a state or local government entity. Keeping a watchful eye on the current retirement plan is smart business practice. Plan requirements change and it’s employer’s responsibility to know when they do. Reviewing the retirement plan each year helps ensure it is compliant with current tax laws. Like routine physicals, retirement plan check-ups can help employer prevent problems or detect them early. They have created ‘Check-up’ brochures for several plans that explain the full importance of reviewing employer’s plan annually and the money-saving benefits of a well-run plan. There are also checklists for some of employer’s plans as a ‘tool’ to help keep employers plan compliant with many important tax rules. Employers may select type of plan to get important information and additional resources on how to maintain it. Mistakes can happen, even in plans maintained by the most conscientious of employers. 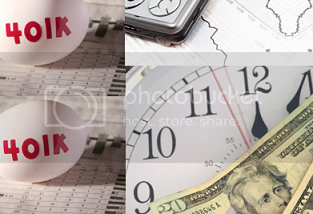 Many mistakes can be corrected on employer’s own, without notifying the IRS. The IRS Employee Plans Compliance Resolution System (EPCRS) helps employers to make corrections to protect participant benefits and keep plans in compliance with the law. If employers have located an error in their plan, they can select that type of plan to get important information and resources, including that plan’s Fix-It Guide or information about correcting plan errors. 1. Only required if plan has employer contributions but never for government plans. 2. Other – Generally, the plan’s assets are held in a tax-exempt trust, though they can also be held in custodial accounts and annuity contracts. 3. All Dollar limits are for 2009 and subject to cost-of-living adjustments in future years (except the age 50+ catch-up contributions for Payroll Deduction IRAs). 4. Employer may contribute to an employee’s retirement account but the total employer and employee contributions may not for 2009 exceed 100% of the employee’s compensation, or $49,000 or more if additional contributions permitted by plan (age 50+ catch-up contributions, 15 or more years of service or 3 years prior to normal retirement age). In a 403(b) plan, compensation means the employee’s includible compensation. 5. Required – The amount an employer must deposit into the plan on behalf of an employee must either be a matching contribution that equals a certain portion or percentage of the employee’s contributions or a minimum non-elective contribution to all plan participants. 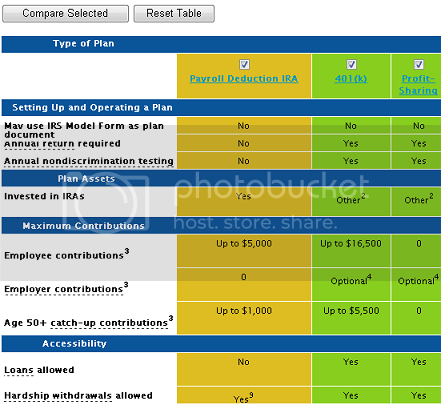 The amount of the required employer contributions vary depending on the plan. 6. The amount of an employer’s annual contributions are determined by an actuary. 7. The maximum combined employer and employee contributions are for 2009 the lesser of 100% of an employee’s includible compensation, or $16,500 or more if additional contributions permitted by plan (age 50+ catch-up contributions or 3 years prior to normal retirement age). 8. Only applies to government plans. 9. Withdrawals may be made at any time, subject to tax. Employers may direct their technical and procedural questions concerning retirement plans to the developer [IRS] in several ways. However, answers to many of questions may already be available under Retirement Plans Frequently Asked Questions (FAQs) on the navigator itself. If you do not find the answer to your question, you may visit EP Customer Account Services on IRS.gov.